You know it’s finally fall weather in Southern California when you can stand to turn the oven on to make Healthier Banana Crumb Muffins (allrecipes.com) and at the same time turn the stove on to make pumpkin curry soup (According to Kelly — that recipe is so simple especially if you use canned organic pumpkin from Trader Joe’s, and you put the whole onion and garlic cloves in the blender with some of the chicken broth to make it smooth). Just look at all these beauties! 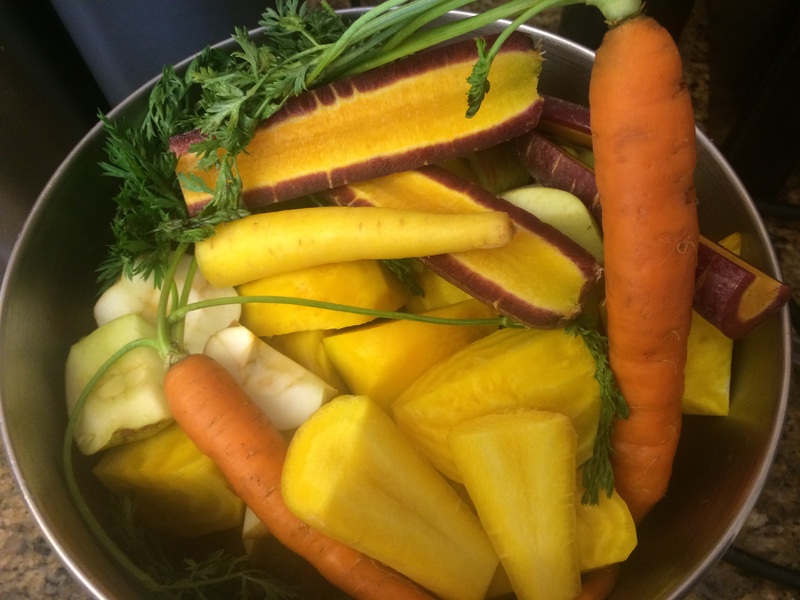 What’s in the bowl: purple, orange and yellow carrots with the carrot greens (organic so no peeling necessary), yellow beets (organic but peeled to reduce the earthy flavor of the beets, although next time I’ll just scrub well and leave on the skins), Rome apples (not peeled but cored — any variety of apple will do), and lemons and limes (peeled but with the white pith still on for that extra boost of vitamins). I love how it separated into these gorgeous colors. I did stir it before drinking, though! 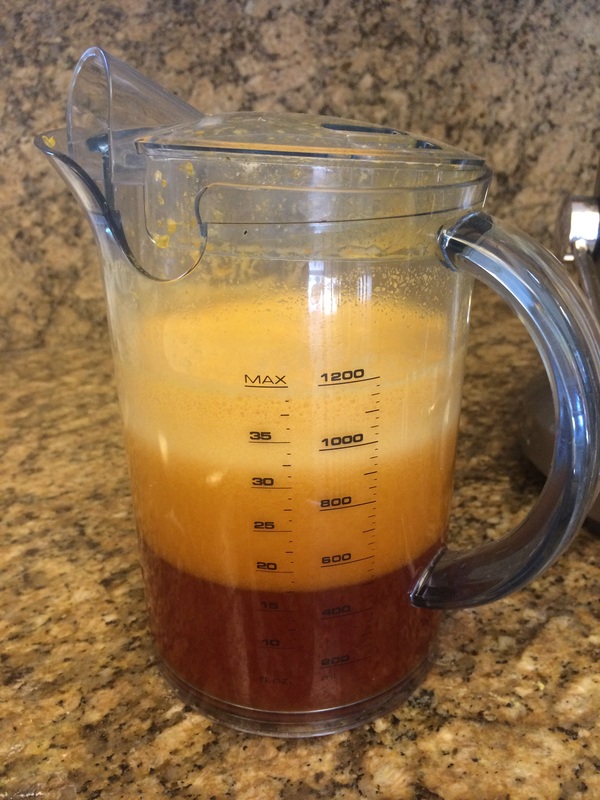 The juice turned out to be delicious! Full disclosure: my 6-year-old hated it and my 12-year-old loved it. The 9-year-old likes beets but is not a fan of beet juice (go figure) so I won’t be trying it on her. The juicer intimidates me (the noise maybe? The violence of the “pressing” — it seems more like a wood chipper than a “presser” to me!) but it is super easy to use and surprisingly easy to clean. My other favorite juice recipe so far is Healthy Green Juice with green apples (any apples, really), kale, celery, cucumber, lemon and ginger. It’s got a kick to it but I love it! Please excuse me when I get all dramatic up in here. I’m just being honest about how I felt when I didn’t make the cutoff for Boston. I didn’t exactly handle it with the grace I would like to have had. I felt very bitter. I kinda wanted to shout, “Fine then! I didn’t want to run your dumb old super-expensive race anyway! I already lived in Boston for two years. I don’t need to see it again! You just saved me the cost of airline tickets and a hotel room and now I don’t have to pull my kids out of school to fly across the country!” I thought of boycotting The Boston Marathon, of not even trying to qualify again. Of course, then I calmed down and admitted that if I was so upset by not getting to go to Boston, it simply meant that I cared a lot about getting to go. 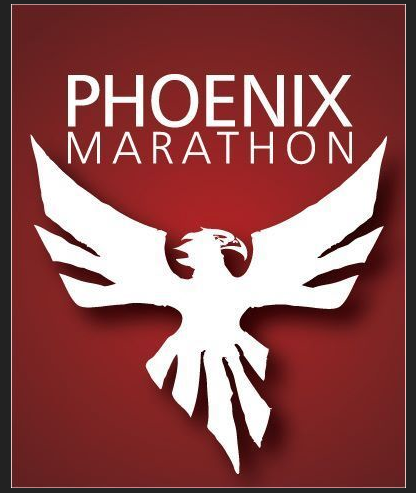 And I promptly signed up for full marathon #5, the Phoenix Marathon (hence my oh-so-clever post title about the phoenix rising up from the ashes). So that’s where I’ll be on February 28, 2015. Believe it or not, the 20-week competitive marathon training plan I chose from Smart Marathon Training starts next Sunday with a 10-mile long run. Today I knocked out an 8-mile tempo run at 8:00 per mile and that felt great, so I feel ready to tackle the plan. I had the tiniest bit of buyer’s remorse (racer’s remorse?) after hitting the “register” key for Phoenix because it has a downhill profile with nearly 1,000 feet in elevation loss, similar to the Mountains 2 Beach Marathon where I bonked so hard. Downhill running can pound your quads and also trick you (and by you I mean me) into going out too fast and then bonking later in the race. So, I’m trying to learn from my past mistakes and I’m incorporating downhill training into my weekly runs. Most people would call it “hill repeats” and consider the uphill part the part that’s building strength and thus speed, but I’m more interested in the downhill part where I work on keeping my foot turnover light and quick! Last Wednesday I ran a warm-up mile to a perfect, steep 0.4-mile hill. I ran up (and down) that four times and then ran a cooldown mile back to my car. (I would have run more repeats but that was the amount of time I had in the 45 minutes my daughter is in gymnastics class). To help allay my downhill race worries I’ve also signed up for a downhill half marathon that fits perfectly in my training plan. In place of a 16-mile long run on a Sunday, I’ll race 13.1 miles on a Saturday down Highway 39, a beautiful route through the forests and canyons of Angeles National Forest to the foothills of Azusa. It’s the inaugural REVEL Canyon City Marathon & Half Marathon on November 15, 2014. (Tip: if you want to sign up for the race, make sure you go to RaceShed.com for a $5 off discount code, and also snag an extra $5 off for allowing REVEL to share your entry on Facebook). The half marathon has a net loss of 933 feet, close to the amount of the loss over the full marathon course in Phoenix. So, here I go again! Does anyone have any thoughts or tips on downhill running?